Designed to make a positive environmental and social impact on the city, the master plan integrates a range of urban strategies, varying in scale, function and language, aiming to create a new civic destination, provid¬ing new public spaces, an accessible quayside, pedestrian and cycle routes. Paradoxically, over time the site has become unattractive to pedestrians and has been cut off from the life of the city. The urban plan for its regeneration reclaims the quaysides as a civic space, creating new informal venues for performances and events and a safe, semi-pedestrianized public realm, by making the all area opened “on all sides to the rest of the city”. Therefore, from the main square, a net of pathways is created, built in concrete, that links it (the square) to the Main Street (Glavnata) and that aggregate a wide range of spaces such as: green areas, water surfaces, and archaeological. The concrete pavement is created with a mixture of limestone substance, so that a color combination similar to the one if the ruins is achieved. The material would change and age in time, so a resemblance with the ancient roman ruins would be observed in the future more clearly. 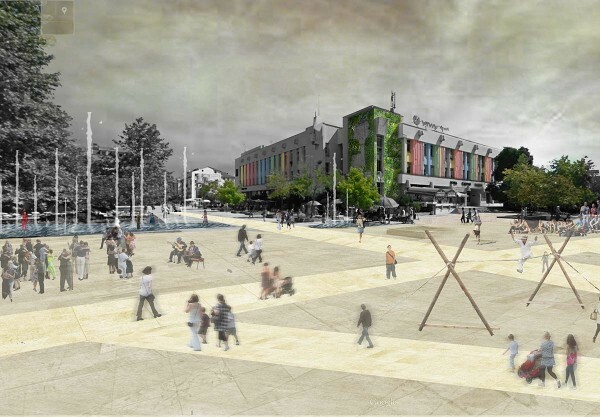 It builds a strong sense of place and reinforces pedestrian connections to the center, allowing it to become an integral part of Plovdiv. On the other hand, the facade of the post office will be “reinterpreted”, by an artistic intervention, preferentially made by local artists. The intervention on the ancient ruins is expected to be one of the main important features of the area. It was designed a single roof canopy, made out of fabric filtering daylight, while deflecting direct solar radiation and sheltering the users when it rains. The canopy is supported by tapering steal columns. The fluid, organic forms generated by the fabric contrast to the solidity of the ruins’ stone and columns. It is planned to significantly increase its capacity of “participate” in the city’s life (not merely a touristic attraction) and establish a new regional and international hub by host a variety number of cultural, social and economic activities. The parking lot strategy is designed to encourage the different use of the space according to the inhabitants needs, promoting and maximizing the availability of space for cultural and social activities, attempting to be suitable to a big number of uses. Movable panels allow the differentiation of space in accordance to the city’s rhythm. These elements close and open the park to the rest of the area. A set of urban furniture was created to be placed strategically around the city. These elements built in modules of 48 x 79 cm, 48 x 158 cm and 48x 236 cm, concentrate social, technical, cultural, laser functions and urban garden, working, as well, as photovoltaic panels, intending to be one of the city’s landmarks, operating as an icon and fomenting Plovdiv’s identity.